We came back to Ontario after 4 years of playing with nature in the sunny South of the Eastern US. This was always going to be a short stay, get our paperwork in order and start looking for the next place we want to live/work/photograph. During this time we were lucky in some ways and unlucky in others. On the less than fun side, we came back to one of the coldest, dreariest autumns that I can remember. I think we saw the sun 3 times in 60 days….and only for a few minutes. Cold and snow came early this year, but with that came some good news. Snowy on the side of the road, finally one close enough to get a shot….too bad the sky is still almost the same shade as the bird. 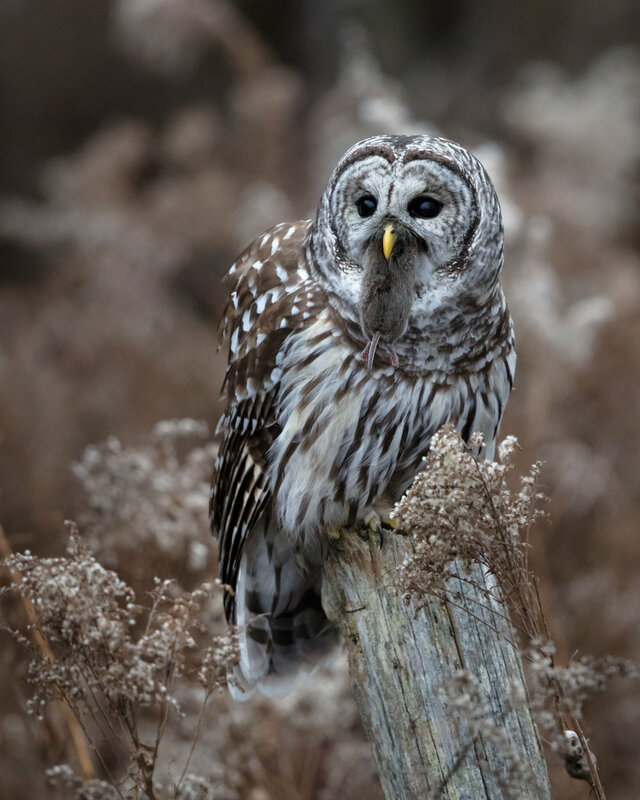 There have been a significant number of owls to be seen in Southern Ontario this fall. Along the north shore of Lake Ontario you can often find (if you are patient and know where to look) 5 types of owls. Great Horned, Barred, short eared, long eared, and Saw-whet are always on the list. Now it seems that last year was a good year up north for lemmings and that often means that a bumper crop of Snowy owls fledge and the next winter many come south to forage. Even this early in the season the carrot fields and shorelines are becoming great places to find one. That is a bit of an understatement as we saw 8 on one day alone. Most of those were far off in the fields but on the last day we did find one in a tree along the road. Breakfast? Lunch? a quick snack, and it didn’t last long. So far this has also been a good season for Barred Owls as they head a little further south for winter. We had cold but fun morning watching a successful vole hunt just a few feet away from us. Start of the hunt, Barred Owl taking it to the voles. I also got a chance to see some Great Horned owls way, way up in the white pines. I did a bit of searching, unsuccessfully for Saw-whet and long eared owls. Those will have to wait for our next trip. Now December has come, and we have finished what we needed to do in Ontario and have decided to spend Christmas back down in the Carolinas where we have already found the sun again. We have left the northern owls behind for now, I’m sure some of my photo friends are getting more shots of the owls that are there and hopefully will get a chance to see some that I missed on this trip. Don’t worry about me too much, as we got back to our property down south we were greeted by our screech owl….well, at least he was sleeping in its usual tree in our front yard. So, where to next??? Maybe out west….we shall see, I’m looking up good birding locations (and I guess a new place to live and work).